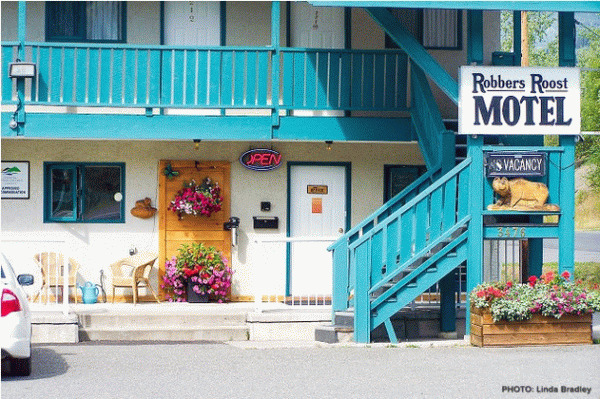 Robber's Roost Motel in scenic New Hazelton in Northwestern BC brings spectacular views of Mt. Roche de Boule for all guests to enjoy. The Robber's Roost Motel is a must-stop before traveling to or from the Yukon Territory or Alaska via the Stewart-Cassiar Highway. Treat yourself to a unique experience of excellent customer service, clean, comfortable guest rooms designed to rejuvenate you, relax you, and prepare you for a new day. Enjoy everything the Hazeltons have to offer including hiking, fishing, swimming, wildlife-viewing, and many cultural activities. This is home to the world-famous, Kispiox River where record-size steelhead trout are found and totem poles scatter the landscape. Don't miss the 'Ksan Historical Museum & Gift Shop located in Historic Old Hazelton across the Hagwilget Suspension Bridge. From the motel, there is access to many hiking trails offering all levels from easy to extremely difficult…your choice! While relaxing at the motel, you can enjoy scenic views, BBQ on the veranda, pick and eat fruits and vegetables from the private garden or walk across the street to Allen Park for a stroll or workout. All guest rooms are equipped with fridge, microwave, coffee, custom amenities, 40" flat screen cable TV, and free Wi-fi. Kitchenettes available. Reservations: 1-877-305-2233, or book on-line: www.robbersroost.ca. 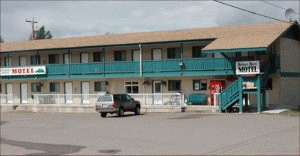 Please visit Robbers Roost Motel Website.